Between one winsome grandfather and one lucky little boy are keepsakes of the heart....memories made by the two of them for all time. Most are simple. Checkers and hot chocolate. Hugs and silly songs. A special wink that means "we're" in this together." But their time together is coming to an end. With insight and tenderness, author Susan Jones tells the story of what comes next for a little boy who discovers memory-making is a language of love that can be whispered across the years. Each book has been autographed by Author Susan Jones. A great book for boys who have just lost their grandfather. This elegant and timeless Memory Capsule Garden Stake is designed to hold and protect keepsake of a loved one who has passed. This memory capsule can be displayed in a garden or at the gravesite. Capsule reads: "No longer by my side...but forever in my heart" Stake measures 19"H and capsule measure 7"L x 3 1/2"W x 2 1/2"D. Capsule is aluminum constructed, powder coated, durable anodized finish with threaded lid and a waterproof seal. Pet Paw print Memorial Stone. Looking for a gift for someone who has lost their dog. 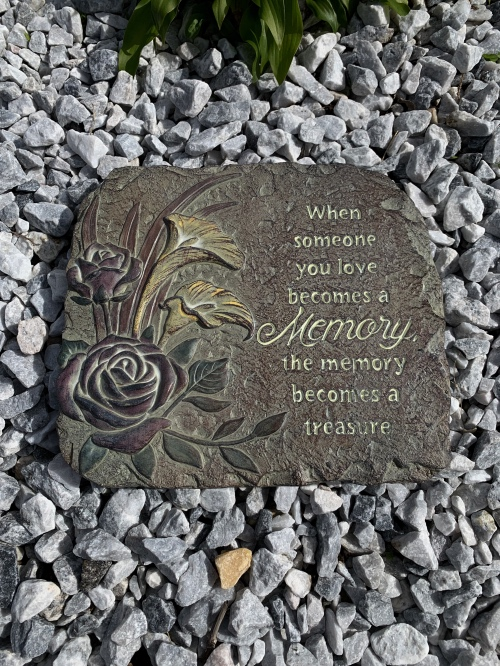 This beautiful memorial stone is the perfect gift. 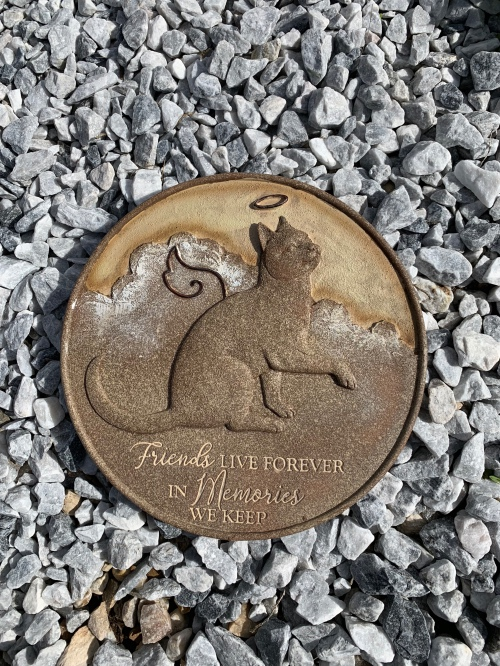 Each resin stone is accented with a metal dog accent for a truly unique memorial. Each heart shaped stone is gift boxed and gift wrapped. Size: 9.75"H x 9.25"W Message on this stone is: "No longer by my side....but Forever in my Heart." Whispers from Heaven Teddy Bear will give comfort and understanding to someone who has lost a loved one. Each Teddy Bear comes with a soft book attached to him and has a place for a loved ones picture inside along with a poem that reads: "Whispers From Heaven - I know you don't understand what happened to me; where did I go - Why did I leave? Jesus sent an angel from heaven above, to hold my hand and express HIS love. She whispered softly in my ear, "It's time to go, Jesus is near." Listen to those who love you, Say your prayers, each and every night. When you need to feel me near, Hug this teddy bear "oh so tight!" My love, you'll take with you as you learn and grow. I'm so proud of you, I LOVE YOU SO! An adorable dog resting in peace with angel wings laying in the soft green grass and red flowers. This tile can be placed in your garden or your can stand it up on a table with the attached stand on the back side. This elegant and timeless Memory Capsule Garden Stake is designed to hold and protect keepsake of a loved one who has passed. This memory capsule can be displayed in a garden or at the gravesite. Capsule reads: "In our hearts and in our minds we will always remember" Stake measures 19"H and capsule measure 7"L x 3 1/2"W x 2 1/2"D. Capsule is aluminum constructed, powder coated, durable anodized finish with threaded lid and a waterproof seal. A beautiful garden stone for your garden that reads: "IN MEMORY of a life so beautifully LIVED" Measures approx. 9 1/2" x 10"
A garden stone to remember a loved one. Reads "If Tears Could Build A Stairway And Memories A Lane, I'd Walk Right Up To Heaven And Bring You Home Again." This resin garden stone can be used in your garden or hung on a wall with its keyhole hanger on the back of the stone. Measures apprroxy. 10 1/2" x 8"
And painted resin garden stone for your beloved cat. The stone reads: "No longer by my side...but Forever in my Heart" Measures approx. 10 1/2" x 8"
A beautiful angel garden stone for your garden. The stone measures 10 1/2" x 8 1/4" and has a beautiful beaded angel on it. The stone reads "I save a path in the garden so Angels can walk through"